Anyone that spends much time administering or developing against SharePoint knows what a pain it can be to work with the log files in a text editor. The SharePoint LogViewer developed by Overroot provides a great interface making it easy to work with and filter down the log files. This is the first in a series of posts relating to topics that may need to be addressed to recover from a bad SharePoint implementation. SharePoint security continues to be misunderstood by many SharePoint power users and some Administrators. It was designed to be flexible, and in doing so can lead people down a road to ruin. One of SharePoint’s greatest assets is that it enables site and content owners to maintain their own permissions. Gone are the days that every request has to be routed through a central IS/IT group. Unfortunately I have yet to see this reach its potential. There are numerous reasons; some site owners do not receive the proper training, some are too busy, some just do not buy into the ownership, and others inherit previously built sites. To take full advantage of the platform’s capabilities owners need to understand and be committed to following through. Make sure that Site Owners know what is expected of them. If they are responsible for maintaining security for their site(s), then reinforce the specifics since in some cases this may not be fully understood. This should also carry into that group’s resource planning. If people are informally assigned the ownership tasks it may not be figured into their normal work schedule. If it is not part of the resource planning shortcuts will inevitably be taken. Furthermore, I have seen a few site administrators cut during downsizing without any visibility to those responsibilities. What is worse, in many cases nobody assumes that ownership after the resource leaves the organization. When developing Site Administrator or Site Owner training, be sure to address proper security. Show examples of where it is done correctly, but also where it was done horribly wrong. Be sure to provide different types of training; in person, written, and interactive. The best way to get a handle on what the current issues are and to generate a plan to resolve those issues is to start by performing an audit. 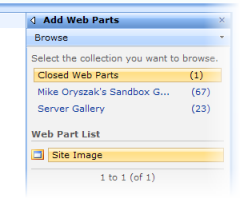 Look at the site collection and subsites and determine what is set to inherit and what is set to be unique. Then look at the individual lists and libraries to review the same. Most of the issues I’ve seen come from site administrators breaking inheritance at the list/library level without understanding what that means. I have also seen issues in libraries where multiple levels of folders are in place with security being set differently at each folder level. Hopefully groups are used to control the access, but in many cases it is individuals. The easiest way to resolve these issues is to just start over. Work with the site owner/administrator to understand the intent and set it to inherit from the parent object and then go back through the steps to setup the specific permissions required. Wherever possible, use groups to provide access to the securable objects. Adding individuals directly to an object does not promote reuse or central management. This creates many of the maintenance issues that lead to problems as sites and content evolves. Using SharePoint Groups versus Active Directory Security Groups has been widely debated so I will not cover it here. Use what is appropriate for your environment. Following these recommendations will help transition the system from chaos to something that meets the site owner’s requirements and promotes maintainability. The next post in this series will cover navigation and Information Architecture issues. SharePoint can prove to be a pain to troubleshoot if you are new to the system, or do not have a good understanding of the system. I intend to give some basic info on how to get started. Use this as a springboard to build your knowledge of the system. I think it is safe to say that all admins know where the Event Viewer is and how to use it. The bad news is that I do not find the Event Viewer nearly as useful with SharePoint as with other apps. It definitely cannot be used alone to resolve most issues unless you have previously encountered the issue(s) and know the fix. The ULS logs are vital to the troubleshooting effort. They contain all kinds of information for both success and failures relating to all of the SharePoint services. They can also be tuned to get additional data when troubleshooting. ULS versus Event Logs – The ULS logs will contain all of the SharePoint messages that bubble up to the event viewer and a whole lot more. This is why I believe it is difficult to troubleshoot based on the Event Viewer alone. What the Event Viewer will tell you that is not located here are non-SharePoint messages dealing things like general server health, connectivity, etc. Multiple Servers – It is important to note that these logs are stored on each server in the farm running a SharePoint service. If you have multiple Web Front Ends (WFEs) you will need to make sure that you check all instances of the logs to be sure that you have all of the information. For example if the user generates an error it will only show up in the logs for the server that user interacted with. Configuring Diagnostics – You can configure the diagnostic levels by navigating to the Central Administration website, Operations, Diagnostic logging. Adjust the levels as appropriate to try and get the information you need. As the name implies, Verbose will give you the most detailed diagnostics. I would not recommend setting all services to Verbose though; I would try and target specific areas in order to reduce the amount of noise extra data creates. How big are the logs? – The size of the logs will vary depending on the level of diagnostics set for each service, the amount of usage on the system, and of course what issues you are experiencing. I have for example seen a database server go offline generating over 1000 errors a minute until the db was available again. Within the diagnostic configuration screen, there are settings to help manage both the number of files and the period of time each log will cover. By setting these two fields to an appropriate value you can help to minimize the storage requirements, and also make each log easier to read. What to look for? – My first course of action is to look for the first error in the log relating to the issue I’m trying to resolve. I then try and look at the information directly preceding that to try and determine if it is related. In many instances the actual error reporting is sort of a generic dump that does not specify the condition or point where the failure occurred. I also look for patterns throughout the file to try and see what might be related, what might be a symptom, and what else is going on that maybe is not related. It should go without saying that if the databases are not available the system will not be as well. Errors like “Cannot connect to Configuration database” will ruin your day in a hurry. Validate Connectivity – I normally start my db troubleshooting by validating connectivity using the main SharePoint service account. An over zealous dba may have made a change that prevents access to the db. Automated Updates – In some rare cases, I believe primarily with WSS, I have seen Windows Update push a patch or update that requires further administration before the system is available again. Basic Install – In cases were a basic install was originally done, you may experience some additional hurdles in maintaining and troubleshooting the database. Early on in your admin career you will probably start with broad moves like restarting the server(s) to clear up issues. As you get a better understanding of the system and when you start to relate the error with a specific server role or service you can start to zero in on the specific sub systems. At that point you can target restarting specific services instead of rebooting one or all of the servers in the farm. One key to maintaining a healthy farm is early detection of issues, and being able to interpret the early symptoms before it leads to a real problem. One example of this that I struggled with for awhile pertained to issues doing a Full Crawl on a medium farm with about 150Gb of content. I started to see a pattern where a seemingly unimportant message in the logs would signal that the indexing service was going to lock up. It is good to know this early in the process, and not 5 hours into the process. Initially the fix included restarting the server, but in this case simply restarting the indexing service was enough to clear up the issue. We then setup a monitor to look for the initial warning message saving us time in getting updated content into the index. Where to turn for SharePoint help? Backup & Recovery needs to be thought about before you have any issues. I cannot count the number of times I have run into people that are trying to fix a major issue but have no current or meaningful backup. This should be a top priority. Disaster Recovery is also vital, but it should be a different approach than normal Backup & Recovery since it includes the whole platform; features and content. Patches and Maintenance should be handled with care and ideally should be tested in a non-production environment first. The time it takes and the issues that may result vary quite a bit. When issues arise, and they will at some point, you need to know how to proceed and/or you need to contact a qualified technician asap.